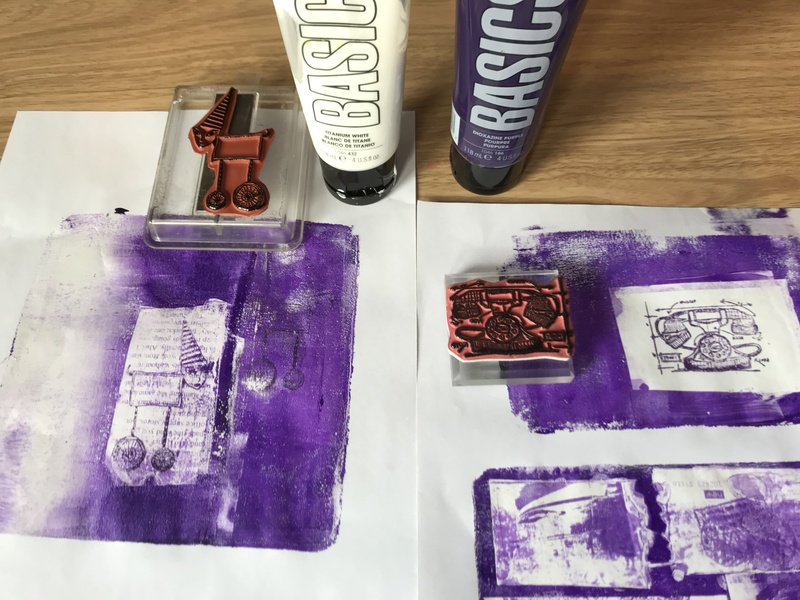 I was super excited when I discovered that it is possible to pull a resist print from the Gelli plate by stamping with pigment ink onto glossy paper from a magazine, then pressing that to a gel plate covered with paint. I think we can all agree there was, upon seeing that, reason to be excited. So, I thought I needed to sit down and do a rather orderly series of attempts to see what happened. Try to come up with a set of rules that would, if not guarantee success, would at lease make it more likely. For the most part, a pretty appalling array. I did discover a few things. 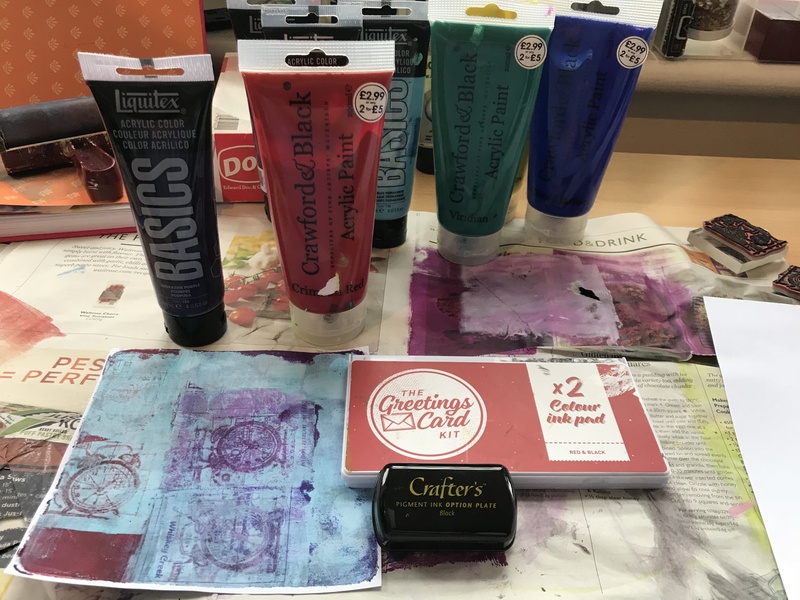 First, and most disappointingly, the only pigment ink that works consistently was the one from the Greetings Card kit. 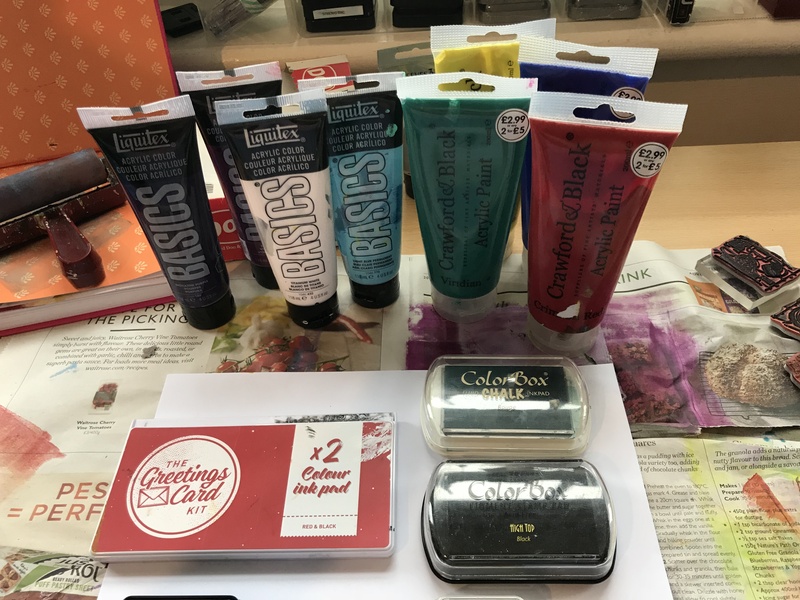 None of the ColorBox inks of any kind worked at all – not the pigment (tried a few colours) not the Chalk ink, not the Cats eye ones. The Studio G left a very very faint hint and might be worth trying again with a jucier pad. In all cases, at least some of the magazine text transferred. So I feel confident the paper is not the problem. 1. The paint on the plate must be thin – almost thin enough to be called transparent. 2. The pigment ink must be wet. 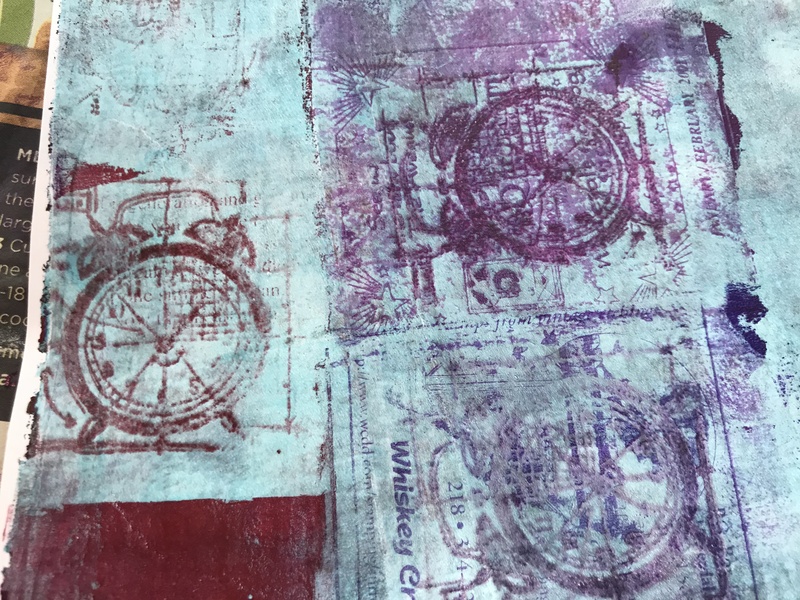 Ink, stamp on the glossy paper, then flip it over on to the plate and burnish the back right away. Don’t dawdle. If the ink is too dry it seems to work less well. 3. Let it dry 100% before adding the next layer of paint and trying to pull the print off. 4. Again, this layer needs to be thin, but don’t overwork it. 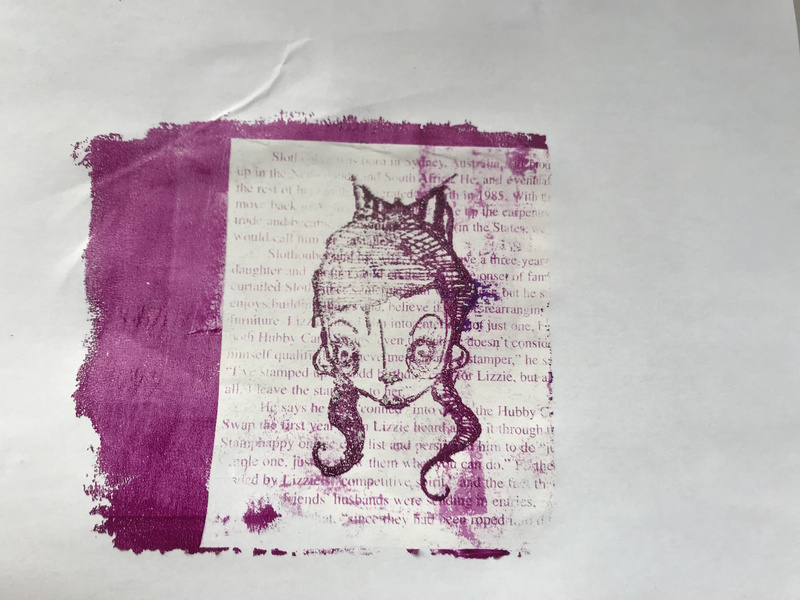 Load the brayer off the plate, roll on the paint and brayer just enough so you can see the image thru the paint. Pull the print quick – don’t let they paint get too dry! The lower right image used the Crafter’s ink and the Basics paint. The other two used the Greetings Card ink and Basics paint for the upper right and Crawford & Black for the left one. As for the most part you are going to only have ONE CHANCE to get a good result, this might just be a little too frustrating to actually try to justify as a technique. To my mind, if 90% of people, using 90% of common variations on the basic supplies can’t get a good result at LEAST 50% of the time, it just might be filed away as interesting, but annoying and potentially wasteful. But it sure has been fun! Categories: Gelli plate monoprints | Tags: Gelli plate | Permalink. very cool technique! I have missed this blog, I just stumbled into my blog reader and decided to explore. 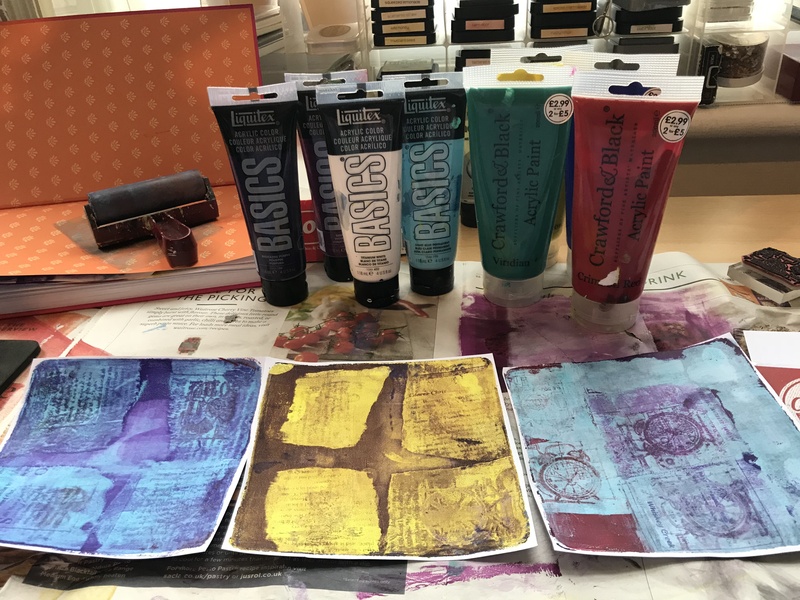 I love gelli printing and this looks fun! Ooh interesting technique nonetheless and I am sure you can find a good way to use the leftovers.